So back to our party … interested in using a fresh palette for you Halloween decorations? How about black and white? The simplicity really allows fresh ideas in to brush away the design cobwebs and help you to be creative. Design your foyer, table, buffet, mantel, staircase or even outdoors. Black and white Halloween pumpkins can be decorated with decals, found items, or painted, without ever having to carve. Use black or white cheese cloth to decorate. It’s thin and holey enough to look aged and creepy and flexible enough to make ghosts or to resemble cobwebs. Hang it everywhere! An old fish bowl can become a crystal ball filled with black tulle and a photo or a mask. Illuminate it as a Halloween centerpiece with candles all around or tiny rice lights. Lighting is important for setting the spooky mood. Decorate candles, candle holders or add inexpensive string lights. Use dollar store black cauldrons for serving bowls. Try an indoor Halloween Tree. Hang ornaments on it like ghosts, pumpkins or bats. You can coordinate your Halloween menu and your treats too. Make the “boos” a part of the theme. I like the idea of cute and scary treats and in-theme libations but when it comes to entrees I tend to shy away from foods that are made to look too gross. Others may not mind it but I begin to lose my appetite. Personally, I love the spiderweb 7 layer dip that was featured in Creative Halloween Party Ideas vs1 and also the Frightened Hot Dogs in a bun but otherwise I tend to lean towards things like fresh, healthy and colorful dishes and finger foods. Foods like shrimp cocktail or sushi. They don’t have to be decorated, they can simply be served on tricked out dinner ware with firey red cocktail sauce. Or try barbecued or grilled chicken or turkey drumsticks in a red marinade like these Halloween Themed Spicy Baked Chicken Drumsticks or these Baked Buffalo Spicy Chicken Drumsticks. For most of this post I am focusing on what’s fairly easy and things that we can make. I like DIY Halloween projects that kids can help with, that help us to save money and look great too. Here’s an idea for a haunted house feeling or spooky garden path that’s super easy to make yourself especially since the creator of these very creative candle wrappers provides free printable files to download and print for your candles. From Mr. Printables with instructions. 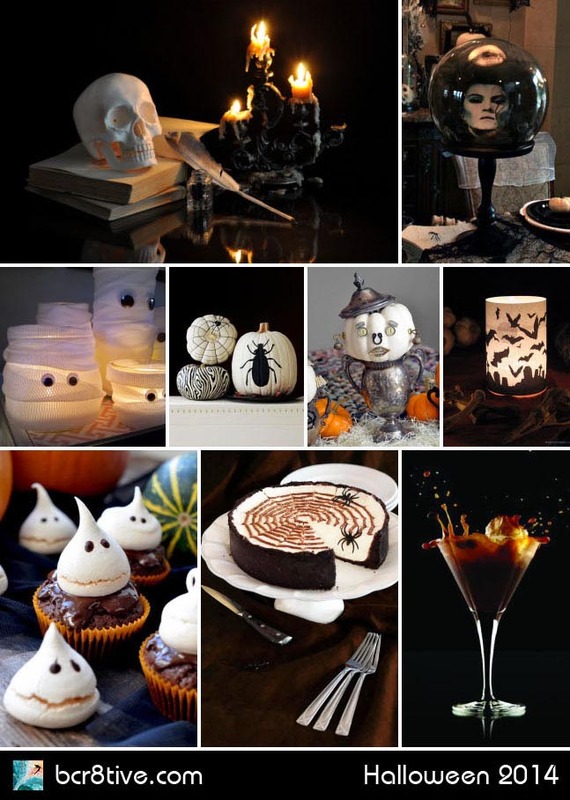 Here is another site that put together an awesome collection of scary Halloween decals to make your own spooky DIY votives or pillar candles and includes detailed instructions. Made from a simple paper towel roll, hot glue and paint and battery tealight candles. Clever Halloween Decorating ideas for a spooky prop and she has made so many different variations. From a fellow Disney fan – and my favorite Disney ride of all – The Haunted Mansion in Disney’s Magic Kingdom. Bev demonstrates her creative genius for Halloween Decorations with these uber creative and spooktastic, DIY crystal ball candlesticks modeled after the Crystal Ball room. This clever remake of Disney’s Madame Leota Crystal Ball, was modeled by Cindy of Beaux R’eves, who has Halloween event planning down to a science. See how she made it. These are adorable and filled with ingenuity. Betsy found a new use for stray and salvaged treasures from local antique markets. She decorates and infuses personas into her little pumpkins. Their bodies are repurposed pots and their faces made up of bits and pieces of old jewelry, lace, buttons, watches, hardware, and tarnished silver pieces. SO cute! These pumpkins are carved freehand and more reminiscent of 18th century lanterns than spooky pumpkins but I love that they’re green. How to make them by Martha Stewart. One easy secret for ominous looking adult beverages for the grown ups at your Halloween party is Black Vodka. IF you’re a cocktail chemist or a super mixology sleuth on Google, you could don your Witch or Warlock hat and find some black vodka potions or concoct your own. I like the idea of a black vodka mudslide or martini, but here are a few other ghoulish recipes. Draw a chocolate web into a martini glass. Place in freezer and chill for a ghostly effect. Shake all ingredients and strain into glass. For a blood effect, drizzle grenadine down the side of the glass. Garnish with a chocolate dipped orange slice OR mix it up in a smoking cauldron. ★ IF you’re considering using dry ice for that spookalicious effect – be certain you do so safely. Here is how you can safely add dry ice to drinks from Betty Crocker. A dark and creepy, no fuss, no bake, delicious cheesecake. By Epicurean Mom – I’m feeling the need for a steaming dark drink to go with this. Now all you have to figure out, is what are you going to wear? for more Fright Night ideas.